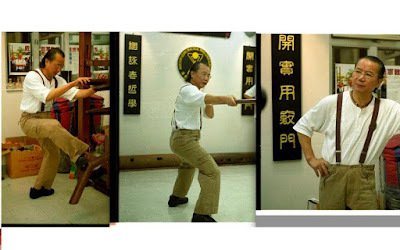 Besides Sifu Gary Lam, Sibak (senior Kung Fu uncle) Wan Kam Leung has to be the most renowned Wing Chun instructor under Sigung (Sifu’s Sifu) Wong Shun Leung around the world right now. Sifu WAN was the only Wing Chun Chief Instructor for the Royal Hong Kong Police Force’s G4 (VIP Protection Unit) and had taught at Ving Tsun Athletic Association for many years. Currently, besides his Hong Kong headquarters, Sibak Wan has established branch schools in eleven countries to promote Wing Chun. I had read some articles about Sibak Wan and seen many videos of him. I have always admired his Wing Chun skill. Yet, I had never had the pleasure of meeting him in person until last week. During the Chinese New Year, Sibak Wan and his wife visited Taiwan and I was very lucky to be able to bring few students to meet them during their short stay. My first impression of Sibak was he didn’t look like a person in his upper 60’ s at all. During our lunch, we talked a lot of Wing Chun subjects. Toward the end of the meal, Sibak grab my hand wanting to show the difference of his straight punch vs traditional straight punch.. Since the space in the restaurant was really limited, so our group decided to move to the near-by Sun Yat-Sen Memorial Hall. Sibak spent several hours to explain to us his “Practical Wing Chun” and touched hands with all of us to demo his techniques. He even demonstrated his Sil Lim Tao and Cham Kil for us. By the time that we had to leave, Sibak still asked me whether there was still any Wing Chun questions that I would like to ask him. Honestly, me and my students didn’t expect all of these at all. This was really a pleasant surprise! While all these were going on, Sibak’s wife just sat on the stone bench watching us with a smile on her face. Although I fully enjoyed what Sibak was teaching us, I felt bad for her because this was her first trip to Taiwan and she had to wait for us to talk Wing Chun for hours. So when we were leaving, I walked to her and said “Sorry that you had to wait for us for so long. It must be boring for you.” She just smiled and said: “Not at all. This (Wing Chun) was his (Sibak’s) interest.” Again, this proves behind every successful man there is a great woman. Thank you, Sibak and Sibakmu (Sibak’s wife), for giving us such a rewarding and memorable day. This experience–to be able to feel such a high-level Wing Chun first hand -let me realize I still have a long way to go in this Wing Chun journey. Lastly, I heard a student of Sibak Wan will open a school here in Taiwan in the future. This is a great news for people in Taiwan who want to learn Wan Kam Leung Practical Wing Chun.